MARSHALL 2555X REISSUE DELLA MITICA 1987 SILVER da 100 watt. Power: 100 W. Foot switch (channel selection) included. Weight: 22.1 kg. Pentode/Triode switching. Inoltre possedeva un preamp. In the heart, in the head, in the air. In what you think. In your strongest and most sincere passions. The music that leads your choices, guides your decisions. The music that rules. 4/8/16 Ohm Boxen Ausgänge. - Effekt Loop. - Klassische Silver Jubilee Preamp Funktion und Sound. - ECC83 und EL34 Röhren Satz. Mono/Stereo Schaltung # 16 oder 4 Ohm Mono; 8 Ohms pro Seite im Stereobetrieb. - Mit 280 Watt belastbar. - Silver Vinyl - Bezugsstoff. Marshall 2555X Silver Jubilee Reissue E-Gitarrentop. E-Gitarren Topteil. Marshall 2555 Silver Jubilee Reissue. Power Amp: 4 x EL34. Pramp: 3 x ECC83. Channels: 2. E-Guitar Head. 100 Watt Leistung. High/Low Output (Pentode/Triode-Umschaltung der Endstufe von 100 Watt auf 50 Watt). - 8 & 16 Ohm Lautsprecheranschlüsse. - Schaltbares Input Gain (Pull Rhythm Clip => Poti mit Pull-Funktion für die Vorwahl eines satteren Crunch-Pegels). Se han correjidos ciertos problemas de retraso en conmutación existentes en el 2555 original. Puntos externo para el ajuste de bías. La gama Jubilee ofrecía tres modos de trabajo en previo. Clean, Rhythm, y Lead activable con pedal. The Marshall 2525HD5 is the result of downsizing the legendary Silver Jubilee amp into a 20-watt head. GAK Saving: % OFF. RRP £ 0.00. Code: 909652. All Categories. Amplifiers > Guitar Amplifiers > Amp Heads. What you are looking at is my1987 Marshall 2555 Silver Jubilee Head. This thing is sweet and sounds killer! This amp is used by Joe Bonamassa, John Frusciante, The Black Crow's ETC ETC! Einen saubereren 2555 wird es hier nicht so schnell wieder geben. This is what Slash plays again the 2555 Silver Jubilee heads. This 2555 Slash Signature head is an exact Reissue of these old Jubilees. Built in 1996 only 2000 pieces are made and the first signature Marshall model ever. What you are looking at is my1987 Marshall 2550 Silver Jubilee 50W Head. This thing is sweet and sounds killer! Silver Jubilee amp is used by Joe Bonamassa, John Frusciante, The Black Crow's ETC ETC! For your consideration is an insanely clean Marshall JCM 25/50 Model 2525H all tube amp. VERY low miles, and it sounds killer. Plenty of life left in the tubes. Also has a very nice padded cover for safe transportation. If you're on a quest for your Jubilee head's perfect match, or if you're looking for a cab that looks a little different, your search ends with the Marshall 2536 Silver Jubilee, The original Marshall Silver Jubilee is one of the most sought-after tube amplifiers in all of rock history. 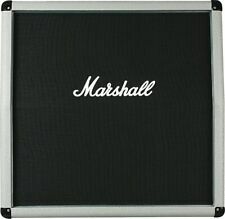 For your consideration is a used Marshall 2536A Silver Jubilee 2x12 vertical guitar cabinet. Low miles on this one.insanely clean. This Marshall 2536A Silver Jubilee 2x12 Angled Cabinet is a closed 2x12" for the Mini Silver Jubilee head. Ideal match for the 2525H Mini Silver Jubilee tube amp head. Side-grip carrying handles for simple transportation. MARSHALL 2555 X SilverJubilee Head 100Watt Vollröhren-Gitarrenverstärker (Reissue). Wer einen waschechten Zweikanaler mit eigener Klangregelung für jeden Kanal sucht, sollte sich also am besten gleich wo anders umschauen - z.B. bei den oben genannten DSLs oder bei den 2-Kanal JVMs. The 20 Watt 2525 Mini Jubilee is expertly crafted and is designed, engineered and constructed to the highest possible standards at the Marshall factory in Bletchley, England. Marshall Mini Jubilee Guitar Amp Head. This is the 2551 4x12", designed to match the 2555X reissue head. Available as the angled-front 2551AV and straight-front 2551BV 4x12". Angled (2551AV) and Straight (2551BV) fronted 4x12" versions available. Authentic Marshall Amp Look. Kick Drum Pedals. Electronic Drum Kits. Drum Stools. Speaker Cabinets. Guitar Amplifiers. Electric Guitars. Bass Guitars. Slash signature half-stack is in the great visual and technical conditon. I can answer ASAP! If you need ASAP! FREE Trial!